We’d love your help. 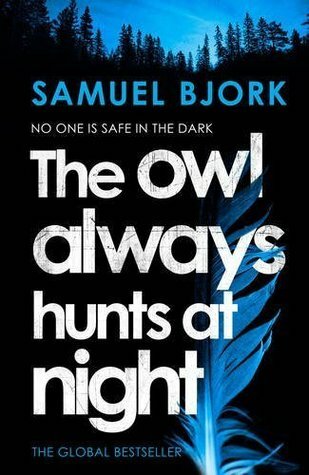 Let us know what’s wrong with this preview of The Owl Always Hunts At Night by Samuel Bjørk. Detective Mia Krüger has been signed off work pending psychological assessment. But her boss has less regard for the rules than he should. Desperate to get Mia ba When a young woman is found dead, the police are quick to respond. But what they find at the scene is unexpected. The body is posed, the scene laboriously set. And there is almost no forensic evidence to be found. To ask other readers questions about The Owl Always Hunts At Night, please sign up. This question contains spoilers… (view spoiler)[I really enjoyed this until the last two chapters. So who’s funeral is it that Munch has arranged ?! Roxana Bociat The funeral was for Lindkvist, a detective and a good friend of Munch. The guy worked with Munch and was like a father to him. This is dark and bleak Nordic noir set in Norway. It is the second in the Holger Munch and Mia Kruger series and the first I have read. It works reasonably well as a standalone. It begins with Tom Petterson, a botanist, discovering the dead body of a emaciated teenager. There are signs of rituals attached to the murder with the presence of a pentagon, owl feathers, candles, wig, a horse head tattoo and a flower in the mouth. Holger Munch is at his ex wife's home and reeling from the news that sh This is dark and bleak Nordic noir set in Norway. It is the second in the Holger Munch and Mia Kruger series and the first I have read. It works reasonably well as a standalone. It begins with Tom Petterson, a botanist, discovering the dead body of a emaciated teenager. There are signs of rituals attached to the murder with the presence of a pentagon, owl feathers, candles, wig, a horse head tattoo and a flower in the mouth. Holger Munch is at his ex wife's home and reeling from the news that she is to be married when he is called out to the scene. After grovelling to his superior, he manages to get the suspended Mia Kruger working on the investigating team. Mia is not in a great place, still mourning the loss of her sister, Sigrid, and in the midst of contemplating suicide. The case helps her refocus her attention away from her personal issues for a while. This is a case with its roots in the past. The team follow several threads to the case that lead to a children's home housed within a plant nursery. The various people and children are investigated. In the meantime, Gabriel Mork, a IT and technology expert, has a friend from his past, Skunk. who draws the team's attention to a disturbing and horrific video on the dark web featuring the dead girl. The police team have their own problems such as Jon 'Curry' Larsen drinking and relationship problems. Miriam Munch, Holger's daughter, is experiencing angst that has her engaging in a extra-marital affair and animal liberation activity. There are a number of twists before the shocking finale. Samuel Bjørk has created a dark and disturbing Nordic thriller, which ( though not fast paced or action packed ) still managed to fill the pages with a real chill factor, and a constant feeling of dread. When a teenage girl is found dead in a forest clearing, in what appears to be a ritualistic killing, Holger Munch ( head of Oslo's homicide unit) and Detective Mia Krüger have virtually no forensic evidence from the crime scene to help with their inquiries. Krüger has been signed off from work while receiving psychological assessment, but Munch brings her back in an unofficial deal to work this case - he believes that she can spot things that some would too easily overlook, that she somehow has instincts that others lack. Munch has his own issues, he's still obsessed with his ex wife, and finds it impossible to move on. He's grumpy, overweight, completely unfit, and a chain smoker to boot. This investigation isn't going to be solved any time soon - there are numerous suspects, with many false trails, and while the finger of suspicion is pointed, there is never quite enough evidence to bring about a conviction, until their hard work is eventually rewarded with the result they've been desperate to achieve. I have to be honest and say that this was a particularly depressing cast of characters. We're used to reading about flawed/damaged detectives, but every single character appeared to have some psychological issue. That said, it was a compelling read. The plot was extremely complex, and included one really sick individual, but it had me completely gripped. There was one sentence towards the end of the book that was in itself an absolute bombshell, but it was announced without fanfare, so much so that I had to read it again just to make sure ( genius)! I’m trying to be a bit selective with the crime series I follow. To only commit to those that start particularly strongly and then, to at least get beyond the first novel! Hence, The Owl Always Hunts At Night, the second book by Samuel Bjork featuring detectives Munch and Krüger. I thoroughly enjoyed I Travel Alone and was looking forward to the second book in this dark, Nordic series. Mia Krüger and Holger Munch come together again to solve another nasty, twisted murder. Krüger the inspired, now I’m trying to be a bit selective with the crime series I follow. To only commit to those that start particularly strongly and then, to at least get beyond the first novel! Mia Krüger and Holger Munch come together again to solve another nasty, twisted murder. Krüger the inspired, now notorious, detective is still in a bad place relying on pills and alcohol to get her through the day. Munch, her boss is still overweight, sad and weary with an ex wife he still loves and children he feels he’s failed. They and their team grapple with the outlandish murder of a teenage girl and gradually uncover a chain of events that is both bizarre and chilling. I enjoyed the way more of the team are given depth and back story, and that the main protagonists are further developed. Many of the characters are psychologically damaged, with mental illness a recurring theme. There are also troubling scenes of abuse and an ever present darkness to this story. But, despite the bleak and and violent subject matter, the book never feels depressing and the action moves relentlessly fast and held me throughout. "The Owl Always Hunts At Night" by Simon Bjork is the second in the Nordic Noir 'Munch/Kruger' police procedural series set in Norway and is a decent thriller and certainly worth a read. The criminal element of the book was interesting to read and quite unique. It gathered pace towards the end and became quite compelling. However, I did feel (in my opinion only) that too much time was spent on the two main characters emotional state of mind and this slightly detracted the story from the main plot "The Owl Always Hunts At Night" by Simon Bjork is the second in the Nordic Noir 'Munch/Kruger' police procedural series set in Norway and is a decent thriller and certainly worth a read. However, I did feel (in my opinion only) that too much time was spent on the two main characters emotional state of mind and this slightly detracted the story from the main plot. Detective Mia Kruger is a woman on the edge, still struggling with several deaths in her family and a distressing case in the previous book which has made her resort to alcohol and various pills to get her through each day. Her boss, homicide investigator Holger Munch is an unfit, tired, overweight policeman who still finds the breakdown of his marriage quite raw. Although Kruger must pass psychiatric therapy before being readmitted back onto cases, she refuses to fully comply. Regardless, Munch is desperate to have her back on the team so therefore brings her in to help solve the mystery of the death of a young girl found in what looks like a ritual murder. When no forensic evidence is found it takes a young hacker to uncover something that makes the team believe they may soon be looking for a second victim. Although I thoroughly enjoyed the main plot in itself, I just found the overload of character emotions throughout the book a little excessive for my liking. I would still read more by this author in the hope that the characters emotional states take a bit more of a back seat to the main story. I understand that the first in the series "I'm Travelling Alone" was a cracking book so I may even look that up to fully understand Kruger's mental issues. I literally just finished this book and guys, it was disturbing. Even sick in a way. It was like watching a really good episode of Criminal Minds, but only with many more characters. In fact, there were so many characters, that I had hard time keeping up with all of them. I'm telling you, if this novel ever gets a movie adaptation, the number of characters will be cut in half (I mean, you have to pay all the actors, right?! ;) ). But nevertheless, this was a great book that kept me on the edge of my I literally just finished this book and guys, it was disturbing. But nevertheless, this was a great book that kept me on the edge of my sit. I buddy read it with my friend Amanda and we both read more chapters then we said we would, each day, because we were to curious to find out what will happen next, and who's the killer and what the hell was going on. I'm telling you, The Owl Always Hunts at Night is the perfect choice to read it with friend, because you can talk, guess and discuss all the time while reading. Γρήγορη πλοκή, πρωτότυπο σενάριο και γενικά είχε ότι περιμένεις να έχει ένα αστυνομικό μυθιστόρημα για να διαβάζεται εύκολα, γρήγορα και να σου ανεβάζει λίγο την αδρεναλίνη. Στα αρνητικά του μόνο η υπερβολή κάποιων χαρακτήρων και καταστάσεων. Όμως αξίζει να διαβαστεί!!! υπεροχο!! ισως καλυτερο και απο το προηγουμενο. This is a disturbing Nordic thriller featuring child abuse and ritualistic killing. When the body of a young woman is found posed in a strange position surrounded by owl feathers and candles in the woods outside of Oslo, Holger Munch (Head of Homicide) and Detective Mia Krüger suspect they are looking for a disturbed killer. The case becomes even more disturbing when one of their team finds video footage of the woman in captivity before her death on the dark web and they realise this is a killer This is a disturbing Nordic thriller featuring child abuse and ritualistic killing. When the body of a young woman is found posed in a strange position surrounded by owl feathers and candles in the woods outside of Oslo, Holger Munch (Head of Homicide) and Detective Mia Krüger suspect they are looking for a disturbed killer. The case becomes even more disturbing when one of their team finds video footage of the woman in captivity before her death on the dark web and they realise this is a killer that will likely strike again. I really enjoyed “I’m Travelling Alone” by Samuel Bjork and was looking forward to reading the second novel featuring Holger Munch and Mia Kruger. When a botanist stumbles over a dead teenage girl in a forest clearing; posed in a pentagon, surrounded by feathers and with a white lily in her mouth, Munch is called to investigate the strange murder. This crime leads them to a local home for troubled children, where the girl was staying, and to crimes with their shadow in the past and yet links to I really enjoyed “I’m Travelling Alone” by Samuel Bjork and was looking forward to reading the second novel featuring Holger Munch and Mia Kruger. When a botanist stumbles over a dead teenage girl in a forest clearing; posed in a pentagon, surrounded by feathers and with a white lily in her mouth, Munch is called to investigate the strange murder. This crime leads them to a local home for troubled children, where the girl was staying, and to crimes with their shadow in the past and yet links to a modern technology that only the newest member of the team, computer specialist, Gabriel Mork, has any understanding of. Holger Munch is relieved to have something to take his mind off the impending re-marriage of his ex-wife. Although the couple divorced many years before, Munch has never come to terms with the failure of his marriage and is deeply depressed. Likewise, Mia Kruger, whose sister died of a heroin overdose is also unable to cope with past events. Deemed unstable and unfit for duty, she is being forced to have therapy and only returns to work when Munch says that he needs her. In a sense, one of the issues with this book is not that it is not fast paced, exciting and full of interesting characters, but that it is both different – but very similar – to the previous novel. The story may be different, but the themes are very similar. In the previous book, Munch was depressed about his divorce and he still is, while Mia Kruger thought about suicide and she still is. That novel was about religious sects, child neglect and mental illness and this book also mirrors many of those themes. Although I really like the fact that the characters in this series are fleshed out by work colleagues and family members, I think the author now needs to move away from those in the vicinity of Munch and Kruger’s world and move away from storylines which involve, and impact on them, so personally. That aside, I did enjoy much of this novel and I do really like the characters – as depressed, and depressing, as they always seem to be! I have hopes that this is just a difficult second novel and that this will evolve into a series which lives up to the promise of the first book. If you enjoy dark and gritty Nordic Noir, then this will certainly be for you – but I suggest you read, “I’m Travelling Alone,” first, as that really explains the characters motivations and sets the scene for this novel. How come the titles of this series always sound so much more interesting than the mystery itself? The Owl Always Hunts at Night brings back "formidable" investigators Munch and Kruger back together to investigate the death of a young girl from a home for troubled youth. Her dead body is discovered posed in a ritualistic fashion and the team is further shocked when it turns out the young girl's captivity was streamed for sadistic billionaires who could afford it. In the midst of this turmoil, Kru How come the titles of this series always sound so much more interesting than the mystery itself? In the midst of this turmoil, Kruger is struggling with suicidal depression stemming from the death of her beloved twin sister 10 years ago and Munch is struggling with the fact that his ex-wife is getting remarried. In the meantime, Munch's daughter, Miriam, just can't get a break considering the events from the first book. Her dalliance with a new lover leads her right into the hands of the very individual Munch and his team are seeking. The plot felt muddied, slapped together, definitely rambling and nothing was fully explained or fleshed out. There's some kind of a cult in Australia that abused children by making them dress as owls for some reason, which was never delved into. A pair of sibling survivors from this cult factor in as suspects but they are red herrings. A disabled mentally ill man also crops up. Another red herring. The villain is a computer prodigy that abducts women who look like his mother, who committed suicide years ago. Paging Dr. Freud! Is he in the house? There was less police procedural drama and more personal digressions. Nearly half of the book is given to Kruger moaning about how much she wants to end it all but Munch's kindness and worry over her prevent her from accomplishing the task. Kruger comes off as a self-serving, selfish brat, not some brilliant detective which we are led to believe has a gift of profound insight into deviant criminal cases. The only thing Kruger seems to be good at is drinking Jägermeister. The other half of the book has Munch dealing with family issues, his ex-wife moving on with her life and his only daughter, a young mother and supposedly responsible, falls head over heels in love with a dude she barely knows, acting more like her shoe size than her age. Munch himself is no Columbo. He's old, smokes too much and his weight is frequently used as a harsh indictment of his appearance. He's not remarkable, not very smart, just average. His team seem to be on the ball and that might give the illusion that he's extremely competent, which he isn't. He's just okay. I didn't like Munch and Kruger in the first book and the same goes here. Το χαρακτηριστικό του Samuel Bjork είναι ότι δεν σε … αφήνει να … αφήσεις εύκολα τα βιβλία του από τα χέρια σου. Έτσι ξεκινάς να διαβάσεις 10-20 σελίδες και καταλήγεις να διαβάσεις καμιά 150. Η ιστορία και η εξέλιξη της είναι ικανοποιητική , οπότε μιλάμε για ένα αρκετά καλό βιβλίο. Το συστήνω σε όσους διαβάζουν αστυνομικό και όχι μόνο! Σασπένς σε όλη την διάρκεια του. Κύλαει φοβερά χωρίς να κάνει κοιλιά και χωρίς περιττές σκηνές. Μπράβο του για την πλοκή και για την ιδέα. Μακάρι να γινόταν ταινία..
Norwegian detectives Holger Munch & Mia Kruger return for a second case in Samuel Bjork's latest thriller. Like his previous crime story, I'm Travelling Alone, the characters are often more interesting than the investigation itself. Most of the story is well constructed, but one part of the plot is so implausibly similar to events in the previous novel that I found it very hard to suspend my disbelief. That aside, it's a very good read & I look forward to the next installment in the serie Norwegian detectives Holger Munch & Mia Kruger return for a second case in Samuel Bjork's latest thriller. Like his previous crime story, I'm Travelling Alone, the characters are often more interesting than the investigation itself. Most of the story is well constructed, but one part of the plot is so implausibly similar to events in the previous novel that I found it very hard to suspend my disbelief. That aside, it's a very good read & I look forward to the next installment in the series. The Owl Always Hunts at Night is the second novel by Norwegian author Samuel Bjork and my introduction to Holger Munch and Mia Kruger. This can be read as a standalone but there were quite a few references to Mia’s sister Sigrid who died in the first novel. Her death is something Mia still struggles to come to terms with, so maybe I did wish I read that one first even if it’s not a necessity. I liked the two main characters, they’re both flawed and intriguing. Holger Munch is still struggling whe The Owl Always Hunts at Night is the second novel by Norwegian author Samuel Bjork and my introduction to Holger Munch and Mia Kruger. This can be read as a standalone but there were quite a few references to Mia’s sister Sigrid who died in the first novel. Her death is something Mia still struggles to come to terms with, so maybe I did wish I read that one first even if it’s not a necessity. I liked the two main characters, they’re both flawed and intriguing. Holger Munch is still struggling when he sees his ex-wife with another man. He feels guilty for not seeing his daughter and granddaughter more but when a new case of a 17 year old girl found murdered under mysterious circumstances lands in his lap, old habits spring to life and he quickly forgets his good intentions of getting more involved in their lives. When his daughter Miriam struggles with her relationship and reaches out to him, he doesn’t even have time to get back to her. The Jane Doe’s identity is quickly established as being one of the girls staying at Hurumlandet Nurseries, an institution for troubled teens. She didn’t like being told what to do so when the head received a text message saying she was ok and they should stop looking for her, nobody was very worried. Even though Holger is the lead detective and the more experienced one, it seems Mia is predestined to steal the show. She seems to have a special sixth sense that made her crack the case in the previous novel and everyone is anticipating she will force a breakthrough here too. Her previous victory has put her on a pedestal apparently among her co-workers but at the same time she is still silently struggling with demons of her past, the death of her sister and her addiction to pills. I have to admit that this bothered me a little bit because I simply couldn’t understand why she was given so much credit. The way the body was positioned seems to mean something, as was the fact that she was found surrounded by owl feathers. Someone with a very twisted past and an unhealthy obsession for owls seems to be at work again. The prologue gives a little teaser but I was left guessing about the person’s identity in the present day. I was practically changing my idea every time a new male character was introduced and was searching for ties with the Hurumlandet Nurseries, where she was staying. Once again I found in the end I was completely off the mark. Mr. Bjork made some very intelligent choices in the way he wrote this story. Somewhere between 3.5 - 4 stars for this read! While I didn't love it as much as Book 1 in the series (I'M TRAVELING ALONE), I still wholly enjoyed it. The case central to this story wasn't as compelling to me as the case in I'M TRAVELING ALONE - but it was awesome to be back in the world of these characters. Full review to come! Uiteraard zijn Holger Munch en Mia Krüger weer van de partij en mogen zij zich weer s Vorig jaar was daar “ineens” Ik reis alleen van Samuel Bjork. Een droomdebuut en thriller die in korte tijd uitgroeide tot een zeer veel gelezen boek bij thrillerliefhebbers. De reacties waren voornamelijk positief en zelf vond ik het boek ook geweldig. Ik was dan ook erg blij toen het nieuws kwam dat het 2e boek eraan ging komen. Nu, één jaar later is het vervolg er, die de titel ‘De doodsvogel’ heeft gekregen. Uiteraard zijn Holger Munch en Mia Krüger weer van de partij en mogen zij zich weer storten op een zenuwslopende moordzaak. Een tienermeisje is vermoord en het lijkt onderdeel te zijn van een ritueel. Wie of wat zit hier achter, een duivelse sekte? Stukje bij beetje lukt het de puzzel op te lossen, maar de tijd tikt door en kan men de moordenaar te pakken krijgen voordat hij opnieuw toeslaat? Onlangs had ik het er nog met iemand over, er zijn van die auteurs, die schrijven een debuut dat zo ijzersterk is, dat het lastig is dit nog te overtreffen. Lukt Bjork dit wel? Die vraag kan ik al snel beantwoorden met een volmondig Ja! Wat deze auteur doet is een unicum, de man schrijft werkelijk de sterren van de hemel. Met een verhaal en karakters die je diep onder de huid kruipen. Dit is pas zijn 2e boek? Het is bijna niet te geloven. Bjork schrijft zo ontzettend goed, dat je het ene moment denkt dat je een roman leest, het volgende moment een sprookje en weer een ander moment een kinderboek, uiteraard voert in al deze gevallen de thriller de ondertoon en is het allemaal niet zo onschuldig als het in eerste instantie lijkt. Het is heerlijk om weer verder in Holger en Mia hun levens te duiken, en te zien hoe Mia nog steeds worstelt met het verlies van haar familie (en dan met name haar zusje). Maar ondanks haar worstelingen met het leven, een ongelooflijk sterke rechercheur is. Ook Holger, die af en toe zijn ex vrouw nog steeds mist, een goed familieman wil zijn en daarnaast de leiding heeft over zijn hele team. Ook in De doodsvogel komen weer vele actuele dingen aan de orde en dit is dan ook weer een superspannende topthriller geworden. Die als je dacht dat het niet nóg beter kon, laat zien dat dit wel degelijk mogelijk is en je je afvraagt wat dit wel niet met het volgende boek moet gaan worden. (Waar hij, als ik het goed begrepen heb al druk aan bezig is. Gelukkig maar, want de auteur laat ons achter met een behoorlijke cliffhanger). Overigens is dit boek ook goed los te lezen, zo nu en dan grijpt de auteur nog kort even terug op ik reis alleen, maar uiteraard wil je die, net als deze, niet missen! Na dit 2e boek, behoort Samuel Bjork voor mij nú al tot één van de beste auteurs uit Scandinavië en ik hoop dan ook nog veel van hem te mogen lezen! Wat een tegenvaller! Aldoor worden zinnen herhaald en na elke vraag die in een dialoog wordt gesteld volgt het woord "Wat?" Als er dan antwoord wordt gegeven volgt: "Hoe bedoel je?" Dit boek is daardoor een kwart langer geworden dan nodig. Het haalt de vaart er volledig uit. After reading and reviewing the truly exceptional I’m Travelling Alone waaaay back in 2015 I have eagerly awaited the return of the homicide investigative team with their very private lives and ‘tells’ that manifest themselves when things aren’t going so well. I’m thrilled to see Holger Munch back at the helm solving cryptic puzzles for fun, thoroughly embracing his grouchy-smoker-overweight side, and still in denial about his divorce from Marianne despite all the years that have passed and the new man now in her life. The skills of his team are sorely tested when they receive a call from the scene of a meticulously staged ritual. The victim is an emaciated teenager, inexplicably posed on a feathered bed surrounded by a pentagram of candles, wearing nothing except for a blonde wig. It’s clear she suffered a harrowing ordeal before she was brought to her final resting place but there is no evidence for them to go on, not even to identity her. Holger Munch needs Mia Krüger back on the team. Rather he needs her enviable talent for discerning what others can’t. I find it admirable and that Holger thinks he knows best, ignoring the facts which prevent Mia returning to work until her therapist declares her fit. So long as she keeps a low profile Holger is confident he can get her expert assessment of this new case, but low profiles and Mia aren’t always compatible. This time, rather than thriving on the thinking process she relies on, she is more distracted and remote than usual which is an unhealthy combination and begins to hinder the significant breakthrough the case requires. The Owl Always Hunts at Night is brimming with damaged souls and even those who have found a place to belong are ironically more vulnerable than they have ever been in their entire lives. An abundance of decoys are fed into the story to lure you away from the genuine culprit, while brief glimpses into the past had me thinking how tragic the some of the suspects’ lives had been, each experience moulding them into person they became. All-in-all The Owl Always Hunts at Night is a startlingly phenomenal read where the complexities of the mind, criminal or otherwise, threaten consume the characters in countless ways. It’s unreservedly compelling and highly recommended – I’m absolutely looking forward to the next instalment! Μια γυμνή έφηβη κοπέλα εντοπίζεται νεκρή με το σώμα της διπλωμένο σε περίεργη στάση, με ένα λουλούδι στο στόμα και ξαπλωμένη πάνω σε φτερά κουκουβάγιας. Ένας νέος καθ’ έξιν δολοφόνος θα απασχολήσει το γνωστό δίδυμο των ιστοριών του Σάμουελ Μπιορκ. Έρευνες και πάλι έρευνες, ψάξιμο, σκοτεινά μυστικά γύρω από ένα πρότυπο οικοτροφείο ορφανών παιδιών, μια παλιά ιστορία που φτάνει ως την Αυστραλία και η γνωστή μαεστρία του συγγραφέα να ξεδιπλώνει την υπόθεση όπως εκείνος θέλει, αφήνοντας σε αγωνία τον Μια γυμνή έφηβη κοπέλα εντοπίζεται νεκρή με το σώμα της διπλωμένο σε περίεργη στάση, με ένα λουλούδι στο στόμα και ξαπλωμένη πάνω σε φτερά κουκουβάγιας. Ένας νέος καθ’ έξιν δολοφόνος θα απασχολήσει το γνωστό δίδυμο των ιστοριών του Σάμουελ Μπιορκ. Έρευνες και πάλι έρευνες, ψάξιμο, σκοτεινά μυστικά γύρω από ένα πρότυπο οικοτροφείο ορφανών παιδιών, μια παλιά ιστορία που φτάνει ως την Αυστραλία και η γνωστή μαεστρία του συγγραφέα να ξεδιπλώνει την υπόθεση όπως εκείνος θέλει, αφήνοντας σε αγωνία τον αναγνώστη. Εξίσου νοσηρό περιβάλλον με το πρώτο βιβλίο της σειράς, εξίσου ανατρεπτικό, μου φάνηκε όμως εν συνόλω σα να σερνόταν στην εξέλιξή του. Η Μία Κρούγκερ δεν έχει ξεπεράσει τον χαμό της δίδυμης αδελφής της κι ας βγήκε στην επιφάνεια μόλις έξι μήνες πριν, χάρη στην υπόθεση του πρώτου βιβλίου. Οι επισκέψεις της στον ψυχολόγο, τα συναισθηματικά και υπαρξιακά της αδιέξοδα και η διαρκής της κατανάλωση χαπιών που αναγκάζουν τις συνομιλίες να επαναλαμβάνονται ξανά και ξανά καλύπτουν υπερβολικά πολλές σελίδες εις βάρος της υπόθεσης. Ο Χόλγκερ Μουνκ προσπαθεί να τα ξαναβρεί με την πρώην γυναίκα του και να καλύψει το κενό επικοινωνίας με την κόρη του, η οποία θα ζήσει ένα φοβερό μπλέξιμο σε αυτήν την υπόθεση, παγιδευμένη ανάμεσα στον άντρα της και σε έναν νεό έρωτα, που ίσως την οδηγήσει σε μονοπάτια που ούτε φαντάζεται. Το φινάλε του βιβλίου μου φάνηκε αρκετά εσπευσμένο και θα έλεγα και ολίγον ex machina. Δυστυχώς δεν το αγκάλιασα όσο περίμενα, όμως δεν παύει να είναι καλογραμμένο και να χαρίζει στον αναγνώστη απλόχερα αυτό που περιμένει: αγωνία, ανατροπές και εκπλήξεις! Wat een goed boek weer met spanning tot het einde & goede verhaallijnen van de personages zelf. “Cú Săn Đêm” (“Uglen”) là tập tiếp theo trong series trinh thám về hai điều tra viên Mia Kruger và Holger Munch. Nếu tập đầu, “Tôi du hành một mình” là một thành công đối với tên tuổi tác giả Samuel Bjork, thì cuốn tiểu thuyết một lần nữa khẳng định tài năng và vị thế đáng gờm của Samuel Bjork trên văn đàn thể loại tiểu thuyết trinh thám Scandinavia. “Cú Săn Đêm” cuốn hút mình ngay từ phần tóm tắt câu chuyện, cùng cách thức xác chết được phát hiện ở đoạn đầu tác phẩm: lõa thể, nằm trên vòng tròn sao năm cánh, trên người phủ đầy lông chim, hai cánh tay bẻ ngoặt theo những hướng kỳ lạ. Tất cả mọi thứ gợi nên một trò chơi điên loạn và kinh tởm của một giáo phái tế thần nào đó (và những vụ án giết người hàng loạt mà có thêm yếu tố giáo phái hành lễ thì đối với mình, độ hấp dẫn đã tăng lên một bậc). Liệu vụ án giết người ở thì hiện tại này có liên quan gì đến câu chuyện ngày xưa được tác giả Samuel Bjork cài cắm vào những trang đầu tiên của quyển sách hay không? Câu trả lời là có đấy, nhưng không theo cách bạn nghĩ thông thường đâu. Vì một lần nữa, độc giả sẽ bị chinh phục bởi độ tinh quái của Samuel Bjork trong cách tạo dựng và sắp xếp các tình huống truyện, như thể vừa đánh lừa vừa trêu ngươi cả độc giả lẫn đội ngũ điều tra. Red herring (thông tin để đánh lừa người đọc hoặc dẫn dụ họ theo một hướng suy nghĩ không hướng đến hung thủ thật sự) rải đều khắp câu chuyện, cho tới tận đoạn phát hiện ra danh tính thật của hung thủ. Nếu ai thích mê những câu chuyện trinh thám kiểu tác giả cho người đọc đi đu quay, lúc lên lúc xuống không biết mệt, plot twists và sự thật được phơi bày một cách dồn dập, kiểu tour de force đồ, thì chắc hẳn sẽ không thích nổi “Cú Săn Đêm” nói riêng và các tác phẩm của Samuel Bjork nói chung. Vì đúng như truyền thống của kha khá các tác giả trinh thám thuộc bán đảo Scandinavia, Bjork cứ nhởn nhơ mà kể chuyện, từ từ nhả từng mảnh sự thật, từng thông tin được khám phá ra về những người/sự kiện liên quan đến cái chết của cô thiếu nữ trẻ tuổi và nơi chốn cô từng lưu lại. Nhưng không vì thế mà câu chuyện kém hay, bởi trước mỗi sự thật được phơi bày đó luôn là những đoạn hội thoại, những câu văn ngắn gọn, đánh vào tâm lý hồi hộp của độc giả. Thú thiệt là mình ôm cuốn này đọc từ chiều thứ Bảy, đến sáng thứ Hai là hết vèo, 400 trang truyện trôi qua như nước chảy, cũng vì luôn muốn biết xem ở chương tiếp theo, Samuel Bjork sẽ giở ngón bài nào ra, sẽ bung cho mình biết thêm những sự thật hoặc phát hiện gì trong quá trình điều tra của các nhân vật. Bên cạnh mạch truyện chính của tác phẩm, đó là điều tra án mạng, “Cú Săn Đêm” cũng tiếp tục tập trung vào việc miêu tả nội tâm, cảm xúc và suy nghĩ của nhân vật chính Mia Kruger và Holger Munch, cùng các nhân vật phụ khác trong tổ trọng án. Đặc biệt với Mia Kruger, mạch cảm xúc, tâm trạng, suy nghĩ của cô là tiếp nối từ tập truyện “Tôi du hành một mình” trước đó, khi cô vẫn hàng ngày hàng giờ đấu tranh với chứng trầm cảm nặng và nỗi đau buồn chưa bao giờ chấm dứt về cái chết của người chị gái sinh đôi của mình – Sigrid Kruger, về những giờ điều trị tâm lý không mấy hiệu quả, về mong muốn được chết theo chị cứ luôn lảng vảng, chựa chờ nhảy xổ ra và nuốt trọn cô. Bên cạnh đó, chúng ta có Miriam Munch – con gái của Holger Munch – làm mẹ từ khi còn rất trẻ (19 tuổi), và mặc dù đang có một cuộc sống đầy đủ tiện nghi với anh bạn trai làm bác sĩ, nhưng cô bỗng dưng không còn cảm thấy hạnh phúc hay có động lực nữa, và khát khao có một chuyến phiêu lưu, một điều gì đó hấp dẫn, hứng thú và ý nghĩa, một mục tiêu sống cho tuổi trẻ của mình. Tất cả những miêu tả nội tâm này, những câu chuyện, suy nghĩ về đời tư của các nhân vật giúp cho Mia, Holger và Miriam trở thành những con người gần gũi, giàu tính người hơn – những con người như chúng ta, cho dù tài giỏi, thông minh đến mức nào, thì vẫn có những bóng ma, những góc tối và khát khao tồn tại trong bản thân họ. Δεύτερο βιβλίο από τον Samuel Bjork, μετά το πολύ καλό «Παγωμένος άγγελος». Η Κουκουβάγια κυμαίνεται στα ίδια επίπεδα και ανεβάζει τον πήχη λίγο παραπάνω. Δεν είναι ένα κλασικό αστυνομικό βιβλίο αλλά περιέχει και στοιχεία ατμοσφαιρικού θρίλερ. Ο Bjork χτίζει μία απίστευτη ιστορία από την κιόλας πρώτη σελίδα και σταδιακά ξεδιπλώνει κάθε πτυχή της υπόθεσης και των χαρακτήρων μέχρι την εξιχνίαση της υπόθεσης και το τέλος τους βιβλίου. • Σκοτεινή, πολύ καλά χτισμένη ιστορία Δεύτερο βιβλίο από τον Samuel Bjork, μετά το πολύ καλό «Παγωμένος άγγελος». Η Κουκουβάγια κυμαίνεται στα ίδια επίπεδα και ανεβάζει τον πήχη λίγο παραπάνω. Δεν είναι ένα κλασικό αστυνομικό βιβλίο αλλά περιέχει και στοιχεία ατμοσφαιρικού θρίλερ. Ο Bjork χτίζει μία απίστευτη ιστορία από την κιόλας πρώτη σελίδα και σταδιακά ξεδιπλώνει κάθε πτυχή της υπόθεσης και των χαρακτήρων μέχρι την εξιχνίαση της υπόθεσης και το τέλος τους βιβλίου. • Σκοτεινή, πολύ καλά χτισμένη ιστορία. • Χωρίς «κενά» στην υπόθεση. • Όχι άλλο μοντγκόμερι για τον Χόλγκερ Μουνκ. Οκ, το καταλάβαμε. Φοράει μοντγκόμερι. • Οι χαρακτήρες δεν είχαν ιδιαίτερη εξέλιξη σε σχέση με το πρώτο βιβλίο. Σε γενικές γραμμές, αξίζει να το διαβάσει κανείς καθώς κινείται σε υψηλά επίπεδα έχοντας περιθώριο για ακόμα υψηλότερα. Net zo goed als het eerste deel. Doodsvogel is het tweede boek van de Noorse auteur Samuel Bjork en het vervolg op Ik reis alleen. Wederom spelen de rechercheurs Holger Munch en Mia Kruger de hoofdrol in dit boek. Holger Munch wordt van de verjaardag van zijn geliefde kleindochter Marion weggeroepen als er een lichaam van een meisje is gevonden in het bos. Zij is gevonden in een macabere setting - liggend in een krans van uilenveren en een door kaarsen gevormd pentagram als een soort van ritueel. Tegelijkertijd heeft Mia Kruger Doodsvogel is het tweede boek van de Noorse auteur Samuel Bjork en het vervolg op Ik reis alleen. Wederom spelen de rechercheurs Holger Munch en Mia Kruger de hoofdrol in dit boek. Holger Munch wordt van de verjaardag van zijn geliefde kleindochter Marion weggeroepen als er een lichaam van een meisje is gevonden in het bos. Zij is gevonden in een macabere setting - liggend in een krans van uilenveren en een door kaarsen gevormd pentagram als een soort van ritueel. Tegelijkertijd heeft Mia Kruger het zwaar, ze vecht nog steeds tegen de demonen in haar hoofd en haar verslavingen. Na enkele bladzijden gelezen te hebben, voelt het direct weer als aan het einde van Ik reis alleen, vertrouwd en betrokken. Alsof je oude bekenden tegenkomt met met hun op onderzoek uitgaat naar de dader. De tweede verhaallijn met in de hoofdrol de dochter van Munch, Miriam, is lang verwarrend, maar zorgt voor een extra dosis spanning in het verhaal. Dat het echter weer Miriam is die in de problemen komt, net als in Ik reis alleen is iets te ongeloofwaardig. Waarom niet iemand anders? Doodsvogel is nog beter als Ik reis alleen. Het plot zit beter in elkaar en het verhaal is strakker, er zijn minder afleidende verwikkelingen. Het lijkt afgezaagd, een oude speurder en een jong meisje met grote problemen, maar de manier waarop Samuel Bjork beiden gebruikt is ijzersterk. Mia Kruger beleeft alles als het ware en komt daardoor tot geniale ingevingen. Door de ervaring van Holger Munch loopt het onderzoek volgens logische stappen. Een combinatie is geweldig en geeft het boek een extra dimensie en maakt het een absolute pageturner. De sterke proloog met de flashback van een meisje vele jaren terug, zet je als lezer continu aan het denken. Wie in het verhaal in de heden is dit meisje of heeft banden met het verhaal in de verleden. Zeer sterk van Samuel Bjork. Hij zaait hiermee continu twijfel, ook door af en toe een kleine subtiele verwijzing in het heden te geven. Τελειώνοντας το.δεύτερο βιβλίο της σειράς έχω να πω ότι ήταν αυτό ακριβώς που περίμενα: Μια αξία συνέχεια του παγωμένου αγγέλου. Με πλοκή η οποία κορυφώνεται προοδευτικά, κράτα αμείωτο το ενδιαφέρον και την αδρεναλίνη σε υψηλά επίπεδα. Δεν είναι τρομακτικό αλλά αγωνιώδες. Ανυπομονείς να δεις τι θα προκύψει στην επόμενη στροφή των "ζαριών". Οι παλαιοί χαρακτήρες παραμένουν όπως τους είχα περιγράψει στο σχόλιό μου για τον Άγγελο. Κι εδώ πρέπει να τονίσω ότι, αντίθετα με τον Φίλιππος Α.Κ., εγώ συμπα Τελειώνοντας το.δεύτερο βιβλίο της σειράς έχω να πω ότι ήταν αυτό ακριβώς που περίμενα: Μια αξία συνέχεια του παγωμένου αγγέλου. Με πλοκή η οποία κορυφώνεται προοδευτικά, κράτα αμείωτο το ενδιαφέρον και την αδρεναλίνη σε υψηλά επίπεδα. Δεν είναι τρομακτικό αλλά αγωνιώδες. Ανυπομονείς να δεις τι θα προκύψει στην επόμενη στροφή των "ζαριών". Οι παλαιοί χαρακτήρες παραμένουν όπως τους είχα περιγράψει στο σχόλιό μου για τον Άγγελο. Κι εδώ πρέπει να τονίσω ότι, αντίθετα με τον Φίλιππος Α.Κ., εγώ συμπαθώ τη Μία και γουστάρω την παράνοια της (έλα Μία, έλα...). Οι νέοι χαρακτήρες, οι σκοτεινοί, μου άρεσαν πιο πολύ από εκείνους του προηγούμενου βιβλίου. Ήταν πιο μεστοί και πιο καλοδουλεμένοι. Βέβαια υπήρχαν και κάποιοι ξέμπαρκοι, όπως πχ ο μελλον σύζυγος της πρώην γυναίκας του Μουνκ, ο οποίος μόνο για μπούγιο υπήρχε, αλλά υποθέτω ότι αυτός μπορεί να πάρει πιο ενεργό ρόλο στο επόμενο βιβλίο. Bjørk’s first installment in the Mia and Munch Series, I’m Traveling Alone, is an international success story that has gained critical acclaim and captivated readers all over the world, including hitting #1 on German newspaper Der Spiegel‘s bestseller list. Samuel Bjørk has been compared to the li Samuel Bjørk is the pen name of Norwegian novelist, playwright and singer/songwriter Frode Sander Øien.